If you have always wanted to check out Capcom’s excellent suite of old-school Mega Man games but found their difficulty too intimidating, here’s your solution: Play them on the Nintendo Switch. 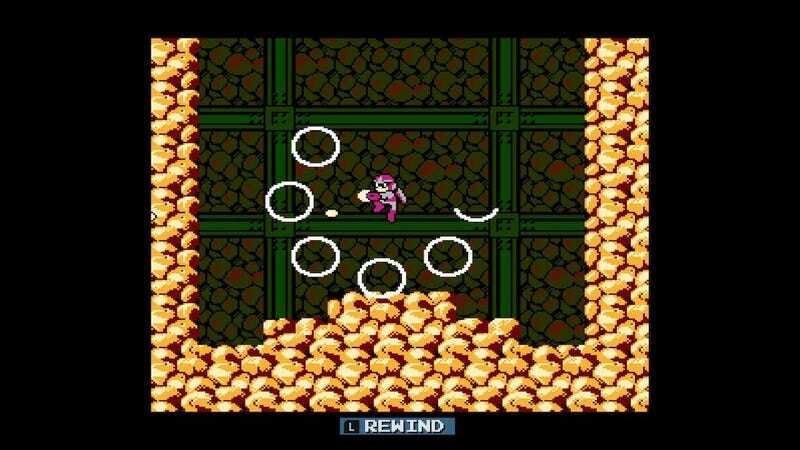 With Mega Man Legacy Collection, which came out last week for Switch and includes the first six games in the series, Capcom has installed a lovely new “rewind” feature that lets you hold a button to skip back in time every time you screw up. Whether you miss a tough jump or get hammered into a spike pit by one of the many cheap-shots that these games love throwing at you, the rewind feature makes all six games far, far less infuriating. One might argue that a feature like this takes away from the nails-tough difficulty that makes old-school Mega Man so special, and to them I would say piss off. Having the option to rewind time will make these games more accessible to players who don’t want to slam their heads against the wall over and over again as they’re trying to jump through rain in Toad Man’s stage or beat all those flaming dogs in Mega Man 2. It’s especially fun to use when you’re fighting bosses, as you can dance through their shots as if you’re putting together a tool-assisted speedrun, or performing an epic ballet of bullets. Sadly, the second Mega Man Legacy Collection (which comes as a download code with the first one) doesn’t have this feature, although the games in that one (Mega Mans 7 through 10) are less brutal than the first six. Mega Man Legacy Collection was already available on a bunch of other consoles, but this feature, combined with the Switch’s portability and general comfort, make Nintendo’s newest console feel like the perfect place to play it.